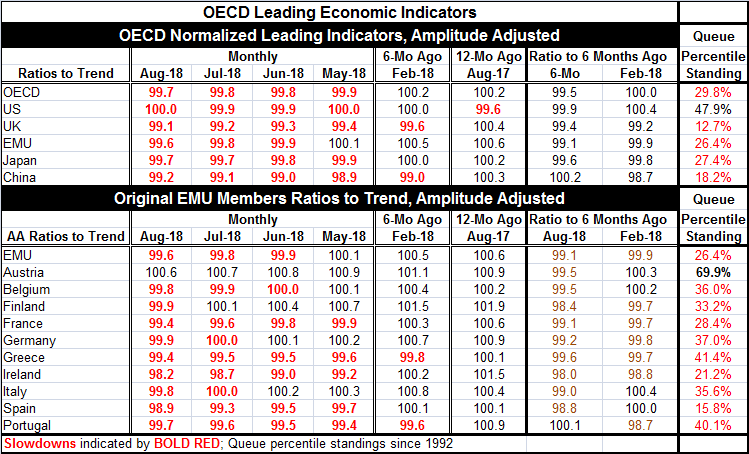 The OECD leading economic indicators (LEIs) show all countries/regions in the top panel below a value of 100 in August except for the United States which stands at a level of 100. Month-to-month only the U.S. and China have improved their readings. For each, an uptick of one tenth of a point is logged in August. Japan's LEI reading is unchanged on the month. Even so, the overall OECD Area reading decays by one tenth of a point in August along with the United Kingdom. The EMU region shaves two tenths off its July standing in August. Only China is stronger than its reading of six months ago. The EMU is nearly a percentage point lower than its reading of six months ago. The percentile standings of the LEI gauges show that all regions/countries in the top panel of the table are below their respective medians (below a rank standing level of 50%). The U.S. is the closest to being at its median at a queue standing reading of 47.9%. The U.K. and China have readings in their lower 20th percentile. The EMU and Japan have readings in their respective 25% to 30% range. For the overall OECD gauge, its standing is at its 29th percentile. All these gauges are in the lower one third of their respective historic queues of value s except the U.S. whose 47th percentile standing leads a very scruffy pack of results. Looking within the EMU at the standing of its oldest members, Austria has the strongest queue standing at its 69th percentile. After that, only Portugal and Greece have standings in their 40th percentiles. Italy, Germany, Finland, and Belgium have standings in their 30th percentile decile with France, Ireland, and Spain at standings below their 30th percentile. Among the 11 EMU members in the table, only Portugal reports a value in August that is stronger than its value of six months ago. And only Austria has a LEI reading in August at or above 100. The EMU region is weak and weakening. With so many of the LEI readings below 100, there is a clear message of substandard growth since values below 100 indicated weaker than normal growth. On top of that, most LEIs are weaker over the last six months, pointing to an ongoing slowing signal. The low queue standings just add some specificity to the poor performance of growth signaled by the OECD's LEIs themselves. The coding in the table below on developing economies is set to identify weakness. Over the last three months over 70% of the developing economy gauges have been declining month-to-month and 70% or more show declines over three months and six months as well. Over 12 months 64% of them are lower on balance. The levels of their LEI gauges are below 100 in 57% of the countries in the table. And 57% of the queue ranked standings are below their respective 50% level and therefore their medians. On balance, the OECD LEIs point to a broad slowing being in place for the developed as well as for the developing countries. These statistics are out of step with the actions that central bankers that have been planning to take. Interest rates are going up in the U.S. despite its below average OECD ratings for future growth. Some U.S. data are strong like the recent nonmanufacturing report. Meanwhile, data in Europe are dodgy and weaker. German industrial output, whose report was released today, fell by 0.3% in August. Output real manufacturing orders as well as real sector sales are falling on balance over 12 months in Germany, Europe's strongest economy. Global growth, which some thought was headed to higher trajectories this year, has been importantly interrupted everywhere except in the U.S. And for the U.S., it may just be that the jury is still out on what growth does there. And the effects of the trade war have yet to manifest themselves. A lot is still in train for global growth and the LEIs are not offering much solace. The geopolitical background and the ongoing trade conflicts provide further reason to curb your enthusiasm.